Should YOU Carry Handgun While Backpacking? If you aren’t proficient with your handgun via competent training and actual live fire practice then please get some training and become efficient and effective with your handgun before carrying it while backpacking or at any other time. Please read our article on where to find concealed carry firearms training and become proficient before carrying a handgun and relying on it as a tool to defend your life. Don’t think that just because you’ve shot it a couple of times a couple of years ago that you’ll be able to use it effectively during a stressful situation… like when a bear is charging at you from 25 yards away and closing fast! Okay, so who else shouldn’t carry a handgun while hiking? I’ve talked to people who are so opposed to taking a life, any life, that they have told me that they couldn’t shoot anyone even if it was to save their own life. If you’re one of those folks who deep down you don’t think you could actually shoot anything or anyone even if your life depended on it then no you don’t need to carry a handgun when hiking, backpacking or at any other time. Carry a can of pepper spray instead, or better yet a large can of bear spray – you can read my article on pepper spray here. To me that type of thought process is incomprehensible, but those people have made a conscious decision to never take a life no matter the circumstances and I’ve found that trying to convince them otherwise is nearly impossible. 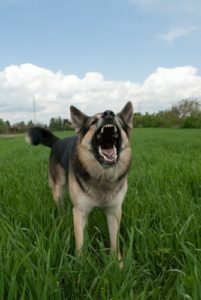 In my experience domestic aggressive dogs have been the most common threat when hiking through and near rural areas or when meeting other hikers with dogs. Before deciding how to carry when hiking and backpacking you’ll need to do a threat assessment. What are the most likely dangers that you’re likely to face while on the trail or at camp? While it’s easy for many people to let their imagination run wild and foresee themselves being caught up in a scene from the moving Wrong Turn or Deliverance, in reality, you’re much more likely to have to deal with a wild animal or aggressive dog(s) when hiking trails run near farms and rural homes than anything else. When it comes to dealing with aggressive dogs near rural homes and farms extra caution should be taken because pulling a gun and shooting someone’s dog can quickly spiral downward and into a deadly encounter with the dog’s owner. Most dog owners aren’t going to be giving you a pat on the back and an apology for their dog’s aggressive behavior after you shoot it. No, most will be pissed off, to say the least, because after all, you are a stranger and the way they see it their dog was only trying to protect their home or farm when you shot it. A situation like this could quickly turn into a deadly encounter with the dog’s owner and that’s something that you don’t want. A much better option when dealing with aggressive dogs when hiking near rural homes and farms is to use bear or pepper spray which is why I always carry both a handgun and bear spray while hiking. So remember that even though a human threat is possible a threat from a wild animal or domestic dogs is far more likely, so plan accordingly. Open or Concealed Carry When Backpacking? 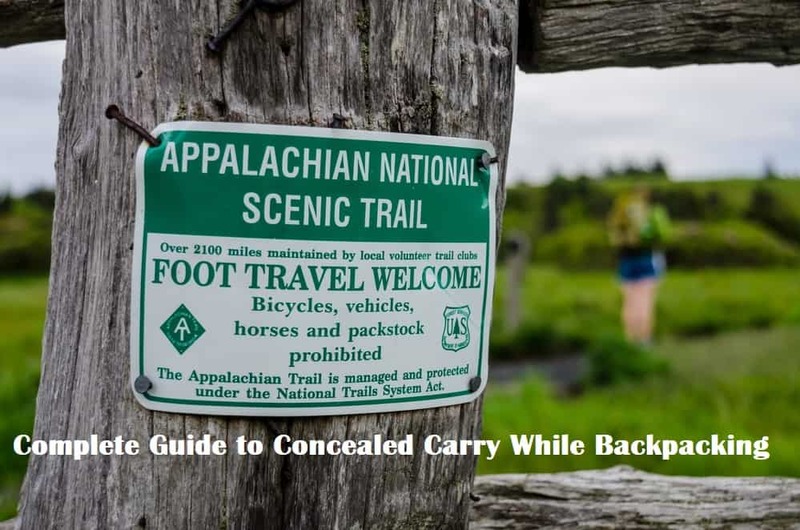 Should you open or concealed carry when backpacking? The answer to that question will depend on several factors with the first factor being where you are backpacking and the open and concealed carry laws in that state. Another factor would be… do you have a handgun carry permit/license and does it allow for both open and concealed carry in your state? In some states, such as Kentucky, for example, open carry is permitted by state law without a permit as long as you’re legally allowed to own a firearm, but you’ll need a license to carry concealed in the state. Another question you’ll need to find the answer to if you’re carrying outside of the state where your carry permit is issued is does that state have a Concealed Carry Reciprocity agreement with your issuing state? And the last question you’ll need to consider is which do you prefer? Do you prefer open or concealed carry? I personally prefer open carry whether it a day hike, section hike, or through hike that crosses several states like the Appalachian Trail. What Handgun Should You Carry When Backpacking? What handgun and in what caliber you carry will depend on your location and what threats you perceive. The most common handgun calibers recommended for “bear country” are 10mm and .44 magnum and I can’t argue with those recommendations. My advice is to carry as large a caliber and as heavy a bullet as you’re comfortable and proficient with. I’m in “black bear country” and carry a Glock 19 X loaded with Cor Bon +P 125gr Self-Defense JHP ammo. This handgun and bullet have almost identical ballistics compared to the .357 magnum with the same bullet weight, but with the advantage of having 17-rounds in the magazine. Some people will probably disagree with my handgun and caliber choice and that’s okay, however, if I were hiking in gizzly bear country I’d definitely up my handgun choice to a 10MM or larger because when it comes to large and aggressive wild animals bigger is usually better. But then my first line of defense against a black bear that gets to close or other animals like aggressive dogs is bear spray. I carry the handgun mainly for those aggressive two-legged predators… aka humans who are intent on robbing and or killing me should we cross paths or if they come into my camp at night with the intent of doing me harm. 9mm vs Bear – while not ideal it can work… when in doubt empty the magazine (accurately). There are several viable options for concealed as well as open carry of a handgun while backpacking and day hiking with my favorite for open carry while lugging a backpack being the Kenai Chest Holster (check current price and availability at Amazon.com). For concealed carry, while backpacking I suggest this Active Pro Gear Jogger Concealment Holster. There are others that are similar to the Active Pro holster but the Active pro is one of the lowest cost options that are still well made and functional. The Alien Gear holsters ShapeShift BackPack Holster is another option and I’ve read some great reviews recommending it, however, I don’t own one myself so I can’t give you a firsthand recommendation on it (you can check availability and the current price on Amzon.com). Can I carry a rifle or shotgun when hiking or backpacking? It depends on your location and the laws there. It’s best to do independent research for your area to find out what laws there are regarding carrying a rifle where you’ll be hiking. Start with online research and then contact the park service and fish and game enforcement for each state where you plan to hike. Remember that some hiking trails (such as the Appalachian Trail) pass through several states. Personally, I would not want to lug around a rifle and ammo while covering miles of trails and then there is the question of what do you do with a rifle when you have to go into or through a town while on a long-distance through hike. A handgun is much easier to deal with. Hello. Everyone from Seattle “ not raining now” for years I have carried. I got Rubbed Over 20 years ago at gun point Down town Seattle ! Ever since No matter. Where I go camping I have my subcompack V10 45 ACP ! Just last year while out some “strange person “ he upset my friend that was with me. ! Would I have use it hell yes ! You can’t (well legally) us deadly force unless your life is in immediate danger. You can’t shoot people just because you’re offended or because your friend is. ????? You would enthusiasticly use it against a strange person person who upset your friend? Can you spell p r i s o n?? What are you talking about? There wasn’t anything like that or about that in my article… Thanks. Hill People Gear Kit Bag or Wilderness Tactical Safepacker. It appears that’s a grizzly in the video (per the hump over its shoulders), I’d carry something bigger than a 9mm in Grizzly country. Just saying. While Grizzly attacks are potentially more lethal than a Black Bear’s, the Black Bear is more prone to attacking humans, per what I’ve read. Here’s an interesting tidbit…. The Kodiak Brown Bear is the biggest bear in North America & has a slow heartbeat. What this translates to is that it can be shot in the heart & still carry on an attack…Not succumbing to such mortal wounds. No doubt I like the idea of a large caliber pistol w/a large shot capacity for the bigger bears. What about wolves, mountain lions & coyotes? Large magazine capacity would be my preference. There’s a lot of you tube videos regarding predator attacks. Having the defense weapon of choice readily accessible is a MUST! One has a fella carrying spray in his left hand, a 44 mag holstered on his chest for the right hand, a 10mm in his holster (RH) & a smaller pistol in his backpack. Sometimes the victim may not see the predator coming. Those brutes move lightning quick! Be alert/stay alert. Sometimes the brunt may cause a weapon to go flying…..
Well.. As a life long hunter. Hiker , and CC holder, please read this carefully. If you shoot a bear with a small subcompact handgun . Or in fact any handgun with ammunition not marked “MAGNUM”. YOU WILL. Most likely piss the bear off and have him attack you. Sometimes all brother bear wants is two square feet of earth. No matter where you move it too. If it is a sow with cubs you better have ten mags , and nerves of steel. 9 times out of ten she will put the hurt on you. Wild hogs are everywhere in the rural south. I once saw a friend shoot AND HIT a wild boar 23 times with a 1911A1 shooting “critical duty” hollow points. He did kill the boar. It dropped about six feet from him , after charging him seven times. Your 9MM (or almost any subcompact) would have been worthless, and you would have been pig food. I live in the country. Don’t shoot hillbilly’s dogs. There is a good chance you’ll get shot for that. When hiking. Stay off the property of others. Watch out for critters that don’t care what kind of gun you have. If you are in bear country or wild hog country carry a 12 Ga. shotgun with slugs or OO buckshot. Hand guns are a “last resort” that all to often fails, Vs. dangerous game. Great points! The shotgun is truly the great equalizer! Watching ‘Alaska State Troopers’ when these guys go after Grizz or Moose or anything big, their weapon of choice is the 12#. I’d prolly vary my loads btwn 00 buck or deerslugs. I’d definitely be very nervous & feel 00 would definitely give some hits. Aiming for ears, eyes, mouth or behind the shoulders may be the best spots in stopping Grizz – Momma or Poppa bear both. Carrying a 12# on a hike would be arduous, better tired than dead though! yuck, some of these beasts will devour their catch while its still alive. Grizz’s like to bury their trophies & feast again once the carcass has decomposed some. See my thoughts at the end of the article under “Related Question”. Thanks. Read them already. I feel my thoughts concurred…. Instead of shooting an attacker in your campground w/ a pistol, wouldn’t the same bear spray on them, be even more effective? Just curious….. Depends on the situation… are they armed? Is there more than one attacker? How far away are they? Understood…. but I compare a bear-spray w/ a garden hose; merely wave it in their general direction; & you’re good…. W/ a gun, you have to be very precise; w/ each shot. Not that I’m against shooting an attacker! (I have a CPL). Each situation is different and you’ll need to make split-second decisions and those decisions will be based on training, the tools available and again the situation.